Ever hear of Alphabet Soup – Google free keyword search tool? It is also called Google Instant technique too. No, not the actual soup, it’s a technique to find keywords, and I might say a highly effective technique. Oh, did I forget to mention it is Free? This is a terrific method of finding relevant up to date keywords that are commonly typed within google every day. 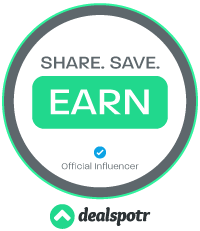 This method along with other methods, some of which I have written about here, What is Jaaxy About?, also Wealthy Affiliate has a great Keyword Tool for members if you use them correctly separately or in conjunction together to truly get the best optimal results. Finding the right keywords is time-consuming and hard if you don’t know how. With the right tools, you can truly uncover and implement a successful keyword or keyword phrase to drive guaranteed traffic barreling down towards your website. 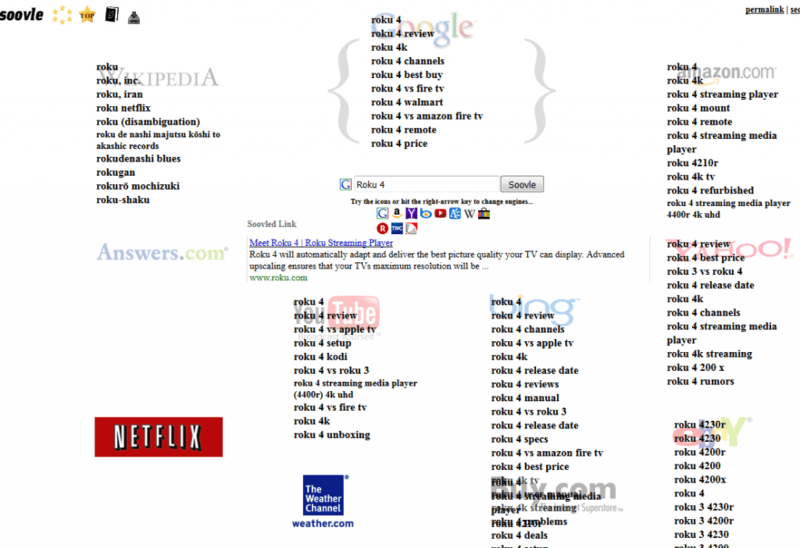 This specific technique is using Google to reveal common keywords that are contemporarily being used on Google. So actively searched terms. Which is Gold to us. Fee Fie Foe Gold, Gold, Gold, Gold. Well, the first thing we want to do is head over to our old trusted amigo Google. Type in a word that relates to your niche to start your keyword search. We are going to use the word Roku 4 for an example. As you can see our kemosabe Google has given us four associated keywords themes. These are some of the most popular topics being searched, related to Roku 4. With about 297,000,000 searches for Roku 4. That’s a lot of searches. Then as the title of this post says, (alphabet soup time) we are going to alphabetically type letter behind our search term Roku 4. To unveil a whole scope of different keywords. So type in the letter “a“ behind Roku 4 and see what come up, when we do. So you can continue to walk through the whole alphabet and find a whole lot of keywords. So type a letter “b” behind the a and see what comes up. For this search, nothing came up when I type Roku 4 ab, but something does come up when I type Roku 4 ac, as shown. You’re probably getting a good idea of how this system works now. You could then type in the letter “b” after Roku 4 and see what comes up. We get the following results from typing b after Roku 4. We could go on and on, but I think you get the gist of how this process works. On your own, you could go through the entire alphabet in this method I have just shown you, with a keyword associated with your niche, and end up with a boatload of related keywords or keyword phrases. Probably more than you would want! That you could plug into Jaaxy or Wealthy Affiliate Keyword Tool to find even more keyword data, to decide to most advantageous and pertinent keyword to use to bring home the traffic. Tools are so important!!! The proper tool and knowledge of how to use such tool is paramount. Tools shouldn’t be overlooked and these my fellow homo sapiens, are what drove our species to advancement. In this slightly different method of Google Instant, instead of typing a letter after our niche keyword we are going to type a letter before the keyword. The other way. So we started with the letter “a” before our niche word Roku 4 and see what turned up. A great term I have found to type before a keyword is, “how to.” This will help to reveal more rich keyword niche words, the more methods you have, the more data you can use. In order to build a colossal list of keywords, there is another tool which you can use in conjunction with alphabet soup technique, and this tool is Soovie. What this tool does is pull commonly used and searched words from numerous site, like Wikipedia, Google, amazon.com, answers.com, YouTube, Bing, Yahoo, eBay, Buy.com, The Weather Channel, and Netflix. Instead of one source, we have multiple sources. So to give an example, we will continue with the same keyword Roku 4 and see what turns up at Soovie.com. So just type whatever word your researching into the middle box. As you can see, you get a lot of results. Each different website gives different results. You are pulling information from 11 places instead of one. More results, which is excellent!! The Keywords that stand out to you, you should write down and or enter them into a Keyword tool like, Jaaxy. 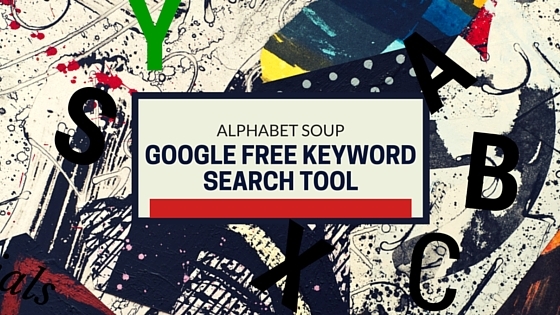 I hope you have learned about Alphabet Soup – Google Free Keywords Search Tool and how to properly use it and with a few tips. When used properly this is a great tool and when used in tandem with another tool is mind blowing!!!!! If you have any question and need help or comments, please do so below. I am more than happy to answer. Thanks!